"He's pretty fearless as far as God's concerned. I don't know whether he's an atheist or he just thinks he'll be able to bulls**t God like he does everybody else." If anything, the benefit of making a film for a network like HBO is that there are no limitations. The ability to expand the story gives ample time to flesh out the characters, and in a film like Empire Falls, it is put to fine use. For the first part of this three-hour story, the material introduces us to the inhabitants of the titular Maine town, and the slow pace and bogged down exposition of the first portion may test the will of even the most patient viewers. But in the second part the film takes on a kind of beautiful sweetness that showcases the talents of everyone involved. Adapted from Richard Russo's 2001 Pulitzer Prize-winning novel of the same name, Empire Falls tells the story of Miles Roby (Harris), the proprietor of a diner who has sacrificed the last 25 years of his life to stay in the river town where he grew up. Miles' problem is that he is complacent with his lot, taking criticism from the town's wealthiest citizen. Francine Whiting (Woodward), who owns most of the town, including co-ownership of Miles' diner. As if this weren't enough, Miles' ex-wife Janine (Hunt) is about to marry a fitness club owner (Farina), his shiftless father (Newman) has no real advice or guidance for him, and his teenage daughter (Panabaker) has taken a liking to the school outcast (Lou Pucci). Through flashbacks we learn about Miles' mother (Wright Penn) and her mysterious suitor (Hoffman) while his father was away in prison. While it may not appear that there is enough of a story to fill a three-hour tale, Russo's novel is replete with side stories and subplots that bring everything to fruition in a finale that trumps the pace. Adapted by the author himself, the script clearly loves its characters to a point where we almost know too much about them, and it becomes clear that this four-hour film could have been condensed to a tighter tale with less exposition. The biggest problem is that Russo lays all of his cards out too early, and that in turn makes the remainder of the film less important, since we know the characters and where their motivations are coming from. Ultimately, the film has no real direction; instead, it meanders from plot point to plot point while it gives us a fine idea of life in Empire Falls but little else. There are notions of hope and love, and Miles somber realization that being passive isn't the same as being kind is a high point, but all the while I kept waiting for something more to happen. As the film reaches its anticipated conclusion we see a glimmer of what could have been had the film worked as well throughout. There is a slowly revealed twist that unfolds beautifully, and it benefits from slowly unfurling rather than being sprung at once. But still. For all of its flaws, Empire Falls is nearly saved by the quality of its performances. Every member of the high-caliber cast does extremely well with their characters. For Harris, Miles represents a change from his roles of late and he does a fine job of showing the pain and emotion that Miles has lived with his entire life. Newman's performance, his second Russo work after the brilliant Nobody's Fool, is a great reason for the legend to rescind his previous statement that he is approaching retirement. Other terrific turns come from Woodward as the empowering Francine Whiting and young Danielle Panabaker as Miles' daughter Tick. Image Transfer Review: The 1.85:1 anamorphic widescreen transfer for Empire Falls is done well, though fairly average. The lush earth tones of Maine are represented well here with only a slight amount of bleeding evident, while there are some slight instances of artifacting seen throughout. Audio Transfer Review: The Dolby Digital 5.1 mix for Empire Falls is about as basic as they come with terrific use of the center channel but limited use of the remaining speakers. Dialogue is crisp and clear and at times the sweeping score comes across nicely to create a satisfying sound mix. 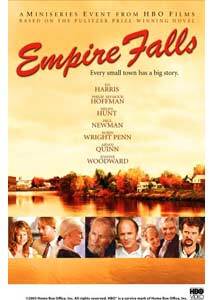 Extras Review: A commentary by author Richard Russo and director Fred Schepisi is the most notable feature on this two-disc set and anything you would ever wish to know about Empire Falls can be found on this track. The history of the project, including Paul Newman buying the rights to the book and spearheading the movement to get the film made is covered, as are the casting choices, stories of the making of the film, and discussions of character motivations, on a track that never feels like it is three hours long. The remaining feature is 12-minute look at the making of the film with cast and crew interviews, but skip this and listen to the commentary instead. Empire Falls retains the consistently high quality we have come to know and expect from HBO films, but even with outstanding performances and assured direction by Fred Schepisi, the film never becomes what you wish it could. A near miss but still a film worthy of a viewing as a rental.